I thoroughly enjoy going through old images to find new ones. By new, I mean old images that were overlooked the first time through. Got it? Good. This is one such image. 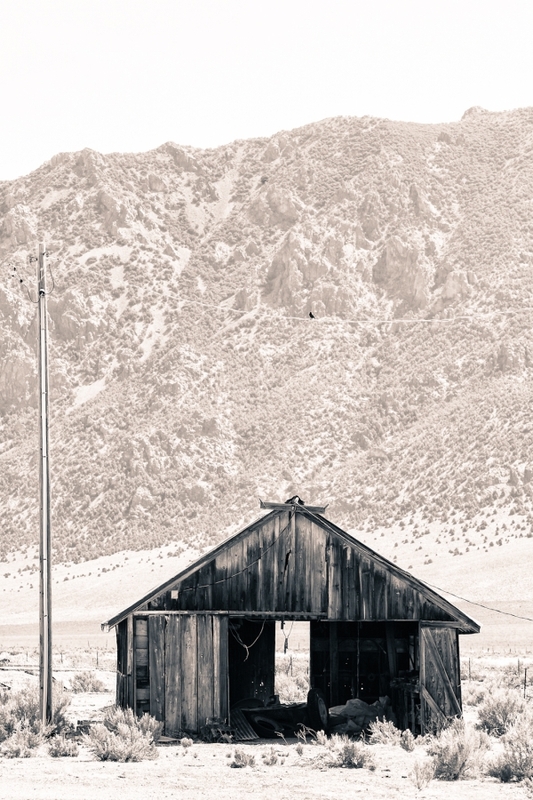 I shot this barn at the Hess Ranch in Central Nevada at a couple of different focal lengths. And yes, I boldly changed lenses in the middle of the desert. Frankly, I don’t think a trip to the desert is complete unless you carry home a few extra dust particles on your sensor. Anyway, I originally published a wider shot of this barn because I thought it fit the overall Hess Ranch set better. But last night I revisited the set and rediscovered this, the initial shot I took of it at about 155mm. I completely forgot about the little bird on the wire. Some processing notes … I converted the image to B&W using Nik Silver Efex Pro. In Lightroom, I applied a cross processing preset called “Old Polar.” And no, the irony of processing an image fron the desert using a “Polar” preset called is not lost on me. Great subject and I like how you processed it. The bird is just a bonus! Great contrast between the background mountains and the barn! The cross-process works extremely well, too! Really like this Bob – glad you made the second pass through! Dude, that is pretty sweet.